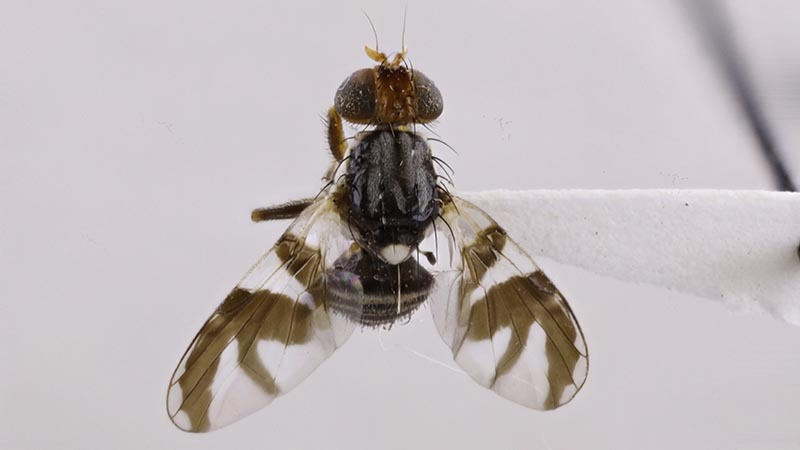 Apple maggot (Rhagoletis pomonella) is a pest fly native to North America and has been a serious pest of apples in Canada for over 100 years. It was identified in Edmonton in 2005. 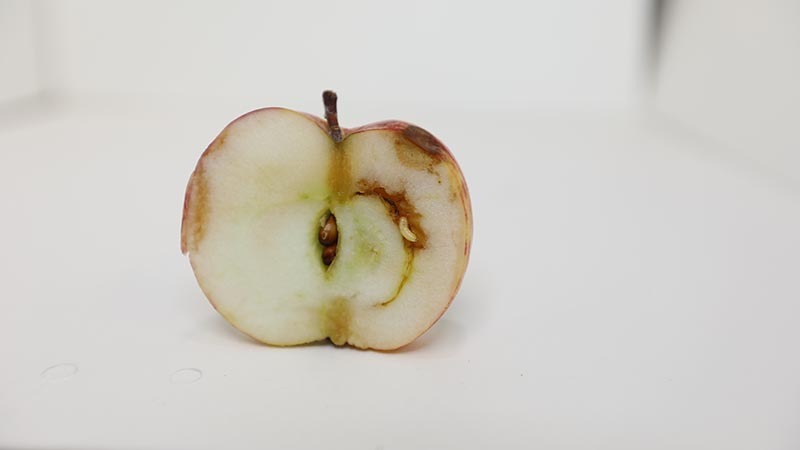 The apple maggot larva burrows in all directions through the flesh of ripening apples feeding on the pulp and leaving brown channels. Pitting, dimpling and black spots on the fruit can mark the puncture sites where female flies have laid eggs in the fruit. The apple maggot mainly attacks apple and hawthorn. They will also sometimes attack sweet cherry, sour cherry, plum, peach, pear and cotoneaster. Pick up any fallen fruit as soon as possible and place it in tightly sealed plastic bags for regular garbage pickup. 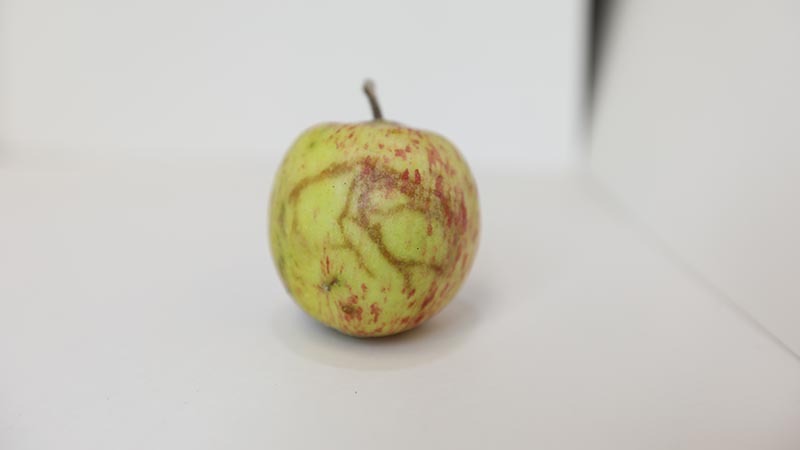 Fruit infested with apple maggot larvae tend to fall from the tree sooner than uninfested fruit and larvae may remain in the fallen fruit for several days before they mature. Timely disposal of the fallen fruit prevents mature larvae from emerging to overwinter as pupae in the soil under the tree. Home composting of infested fruit is not recommended, as it may provide ideal conditions for the larvae and pupae to develop. If you wish to compost the material, make sure the maggots are dead first by cooking (> 70°C/160°F), freezing, or pureeing the fruit in a blender. Commercially available traps are intended primarily for monitoring the presence of apple maggot, but may work as effective control measures in small scale (backyard) settings. They consist of a round red ball coated in apple scent and an adhesive glue to trap the flying adults. After bloom, wrap branches you want to protect in fine mesh to prevent the adults from landing on the apples and laying eggs. Fresh fruit must not be brought into British Columbia from other provinces or countries without a movement certificate or phytosanitary certificate that shows the produce is free of apple maggot. There are also regulations governing movement of plant material that can host apple maggot.